In the spring of 2013, I was contacted by the Mystic Seaport Museum. I had been a Conservation Fellow there in 2000 and worked under the direction of then Curator, William Peterson and Conservator, David Matthieson. My old friend and colleague Christopher White (then Collections Manager) had a request for me. “Would you be interested in conserving the Narwhal Hall Tree?” My first reaction was: “Yes, of course I would”. It is one of the most unusual and cherished pieces of maritime history and I certainly knew the piece since I walked past it in storage many times. Saying yes was the easy part of the project, what laid ahead was the conservation of an object that would take me on a journey of a lifetime. The hall tree was said to be made by Capt. John O. Spicer of Groton, Connecticut on the Whaling Bark Nile in the second half of the 19th century. The hall tree came into the museum’s collection in 1964 (Fig.1). It had descended in the Spicer family and had one other owner before it arrived at the Seaport. After I had accepted the challenge, an account was discovered in the museum’s archives written by Capt. Spicer detailing the story and fabrication of the hall tree. Capt. Spicer states that wood came from the Sandwich Islands and is called “Man-ne-ta wood”. The letter is a fascinating account, rich with fanciful tales of his whaling expedition and his account of how he captures the narwhal with the large tusk. I may be stating the obvious but the hall tree is a very complex object. Four large narwhal tusks mounted on ball feet are arranged around a circular wooden base with a large central column. The tusks are then held to the column by walrus ivory and wooden spindles. 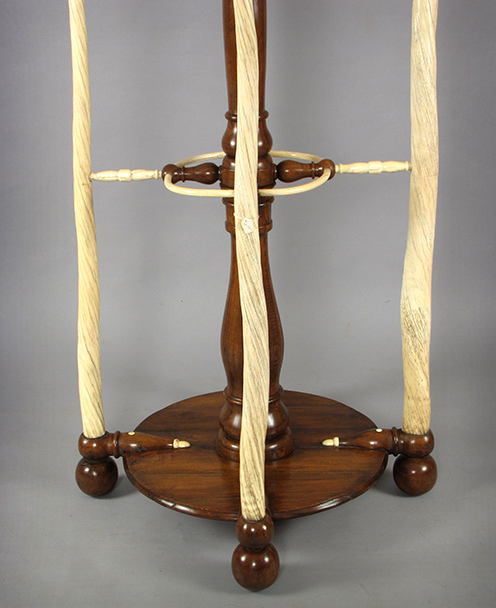 Placed between the four wooden spindles are curved ivory hoops. The top of the central column is capped with a large turning adorned with thirteen walrus ivory hat pegs (Fig. 2). Fig. 1 | The narwhal hall tree. 1964.1227 Courtesy of the Mystic Seaport Museum, Inc. Fig. 2 | The narwhal hall tree before treatment. Photo by RSW, Fallon & Wilkinson, LLC. The first step in the process was to make a site visit. The hall tree was pretty much in the same place and condition that I remembered it, some fourteen years ago. It was being held together with baling twine and wax and was destined to remain in storage if it could not be stabilized. My first question to Chris was: “What prompted the interest in the object after all these years and what was the museum’s vision for the object?” The interest in the hall tree surfaced as a result of a collection survey. A leading scholar on maritime ivory noted that the hall tree was one of the most unique and valuable pieces of maritime history and was far too important an object to remain in storage. The museum’s goal, therefore, was to stabilize the hall tree and prepare it for exhibition. Upon examining the object more closely, two of the four ivory spindles were broken and the only method of keeping them affixed to the wooden spindles was the use of wax, thus the need for the baling twine for stabilization. The large wooden base, made up of several boards glued together, was sagging and split in many locations. Several of the tusks that were attached to the ball feet were loose but I could not say with certainty how they were attached to both the tusks and the wooden base. All the ivory hoops were loose and, to top it all off, all the metal fasteners that were visible were completely corroded. Returning from the site visit, I sat down and reflected on the object and its current condition. My intent was to present a detailed condition report and treatment proposal but during that process, I became painfully aware that there were just too many unknowns to accurately articulate an exact treatment and then answer the ten million dollar question as to the cost of conservation. So what evolved was a series of conversations with Paul O’Pecko, Vice President of Collections and Research. I was frank with Paul and told him that given the complex nature of the object, the inherent vice of the mixed materials, and the unclear understanding of exactly how the object was being held together, the best course of action was to undertake the project knowing that we may have to make compromises and think creatively and outside the box to accomplish the goal. Paul wholeheartedly agreed and the process began. Fig. 3 | Preparing for transport using Ethafoam beams for support. Photo by RSW Fallon & Wilkinson, LLC. With a good understanding of the ramifications of our actions, the first hurdle to overcome was to stabilize the object for transportation. The hall tree is 91” (229cm) tall so it could not be moved standing straight up; it had to travel on its side. Even the thought of moving it scared me, but with a little creative thinking we created a bracing system using two inch Ethafoam beams that served as the system to secure all four tusks to each other and the central shaft (Fig. 3). Confident that we could move the object safely, the fact still remained that we did not fully understand how the object was being held together. Undertaking any conservation without this key piece of information would not be advisable. Fig. 4 | Doug Currie prepares to X-ray the hall tree. Courtesy of the Mashantucket Pequot Museum, Conservation Department. We needed to get the object x-rayed and fortunately the Seaport and I have a good working relationship with the Mashantucket Pequot Museum & Research Center. I contacted Conservator, Doug Currie at the museum and made arrangements to transport the hall tree to their facility. The plan was to transport the hall tree to the Mashantucket Museum, take the x-rays, and then transport the hall tree to our conservation facility. The x-rays provided valuable information as to how the large tusks were attached to the ball feet and how the ivory spindles were attached to the wooden spindles. As we had suspected, all were attached with iron threaded rods now heavily corroded (Fig. 4). With the transportation hurdles solved, the real work began. We needed to develop a treatment proposal that would satisfy our objective, while managing a complex object with corroded metal in contact with ivory, multiple broken pieces, and some pieces completely frozen in place due to the corrosion. Fig. 5 | During Treatment. Repairing the base. Photo by RSW, Fallon & Wilkinson, LLC. The work began by removing the large turned cap to take some of the weight off the base. With that off I was able to clean the ivory, make the necessary fills in the cracked turning, and compensate for a few losses in the ivory hat pegs. Cleaning of the ivory was accomplished by a combination of dry cleaning with erasers and ever so slightly dampened cotton swabs with saliva. The next step was to address the instability of the four narwhal tusks. As mentioned earlier, all tusks were attached to the ivory spindles with metal rods, which were completely corroded. This made it impossible to remove all of the tusks from the base. What did unfold is a series of events that allowed me to remove three out of the four tusks from the base. I was fortunate to only have to remove one tusk at a time and not risk having all of them off at the same time. This allowed me to fix the base as necessary and work on the specific problems that were germane to each tusk (Fig. 5). Fig. 6 | The hall tree after treatment. Photo by Rian Wilkinson, Fallon & Wilkinson, LLC. Fig. 7 | The hall tree after treatment. Photo by Rian Wilkinson, Fallon & Wilkinson, LLC. One of the most interesting twists in the project was the search for this mysterious “manneta wood”. I could find no reference for this wood anywhere. I searched the data base for woods native to the Sandwich Islands and found no reference to any “mannetta wood” So while one of the tusks was removed from the base, I was able to take a wood sample for identification. After much research I determined that the wood on the base was Rhizophora mangle, the common name of which is Red mangrove. Interestingly enough, Red mangrove is not native to the Sandwich Islands and was not even introduced to the islands until 1902. Something didn’t make sense, either I had the wood identification incorrect or the account given by Capt. Spicer was wrong. I was able to confirm my identification by obtaining a certified sample of Red mangrove and comparing it to the sample taken from the hall tree. It was a match. Still not content that the story did not match the evidence, I began to research the Bark Nile and was pleasantly surprised. She was known to be in the Sandwich Islands in1865 and made her last voyage north in 1867. She then found her way back to New London, Connecticut and in 1874 Capt. Spicer made the first of his four voyages to the artic. The more likely story is that even though Spicer’s account said that the hall tree was made from wood from the Sandwich Islands, Spicer may have picked up the wood in the Caribbean when the Nile sailed back to New London sometime between 1867 and 1874. The wood must have been on the ship when she sailed north in 1874 in search of the narwhal and then used it to make the hall tree. At least two other woods appeared to have been used in the hall tree. The wooden spindles have been tentatively identified as Alyxia stellate but this may be an unlikely match since it is a vine and doubtful it would grow to the size large enough to be used for the spindles. The story of the conservation of the hall tree is quite unique. Often, for conservators the objectives are clear, the path to achieving the objectives are straight forward, and the results outstanding. This project was different. The objective was clear, but the path was far from straight forward. In the end it was really about trust and courage. Trust on the museum’s part that we would make the correct conservation decisions and courage on our part to undertake a project fraught with inherent vice. Trust and courage took Capt. Spicer to the Artic on a journey of a life time, his objective clear, his path anything but straight. How poetic that the prize of his journey would travel a parallel path 140 years later and with the same success. On December 11, 2014 the hall tree was successfully returned to the Mystic Seaport. The final voyage now complete, the hall tree will be placed on view for all to enjoy (Fig. 6 and Fig. 7).